do do do do do do do do do do.......... then, the cannons crack in. This is the turning point toward victory over Russia's '...treacherous and cruel enemies....', the invading French, led by Napoleon. The do-do-do bit depicts throngs of peasants pouring into Moscow from their villages and from their towns. SOLIDARITY! Then the miracle. The deep freeze sets in, the Russians capture the French guns now firmly stuck in the snow and they turn those guns against the poor buggers who had dragged them across Europe. Conscripts, cannon fodder. A lesson I learned over the years when fighting workplace bullying relates to work colleagues. Confronting the CEO, en masse, is much more effective than waddling in, on your own, with a cupof tea. Why? Easy to answer, easy to illustrate by example. Some months ago I met someone I had worked with during the years I was swilling around in the pit with Workplace Bullies. After the obligatory, "How are ya? ", I gently skated toward the sixty-four million dollar question. Why did no one back me up? He said; "Rob, we saw what they were doing to you and we didn't want the same treatment." No consolation to me as he was heading back to his fortnightly paid position and I was heading back to the trench to fossick for coins. But, I understood. So, don't expect a great deal of trench warfare support from your work colleagues, but do empathise. 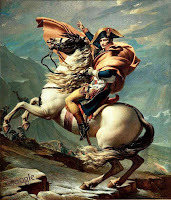 Was Napoleon a bully? Depends on what side of the road you park your bicycle on. But one thing I do know. The last image entering the eyeballs of anyone that bullied him would have been the glint bouncing off his 32 inch sword! Those same people might have thought they were doing something for their own survival. And it is sad that they did not support you. When i was bullied/am bullied (still happening in SA public service) I see people just look the other way. To actually say, "hey, that is bullying" - now that would be wonderful. But no one does. Instead they blame the reaction of the bully. However those same people who thought they were safe by keeping quiet - are probably now being bullied. Bullies like to isolate their victims. And people tip toe around and think it they stay silent it will never happen to them. WRONG. That person is now probably getting the full bullying treatment. Sad that they may have to endure it. So their empathy level will probably rise. But that will be cold comfort to them when they too get kicked out, once the bullies have ruined them completely.